Filled plush toys, Holiday Gift, plush pendant, pillow cushions, plush dolls, etc. Plush Products OEM. 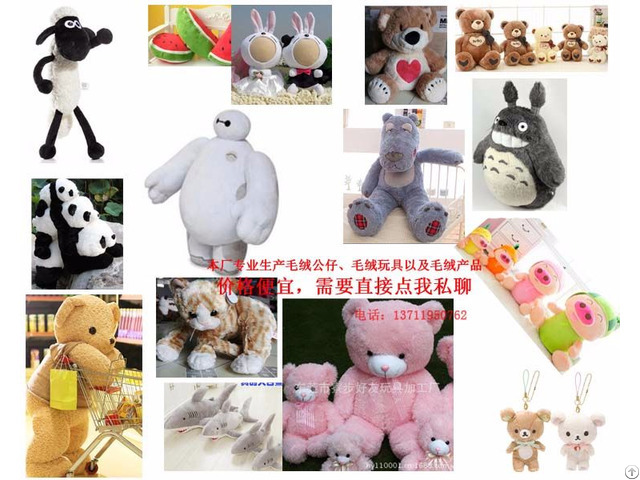 Main business: Plush Toys OEM, Provide drawings or samples. Extensive management experience and raw material suppliers of resources, Enough to ensure PRODUCT QUALITY and LOWEST PRICE.Most of our goods are exported to foreign countries. We are hoping to provide product for your company, Thank You! Posted By: Dongguan City Haoyou Plush Toys Ltd.
Business Description: Filled plush toys, Holiday Gift,plush pendant, pillow cushions, plush dolls, etc. Plush Products OEM.